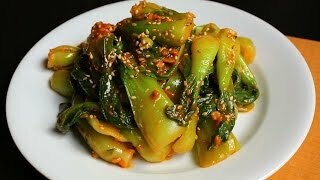 Today I’m going to show you a simple and authentic Korean side dish made with bok choy. Bok choy is easily available at many grocery stores in the USA, although in Korea I would use napa cabbage or sweet potato stems instead. Cut off the ends of each bunch of bok choy and separate the leaves from the stalks. Cut into bite size pieces. Bring a large pot of water into a boil. Blanch the bok choy for about 1 or 2 minutes until the white stems soften. Strain and rinse in cold water to remove any dirt and stop them from cooking. Strain. Combine garlic, green onion, doenjang, gochujang, sugar, and sesame oil in a bowl and mix it with a wooden spoon. Squeeze out the bok choy to remove excess water and add to the bowl. Mix it well by hand. Sprinkle with crispy sesame seeds and serve immediately as a side dish for rice. You can refrigerate it up to 2 days. Posted on Monday, November 24th, 2014 at 5:06 pm. Last updated on December 16, 2014. Posted September 18th, 2018 at 6:40 pm | Log in to reply. 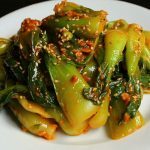 Well, I made your Bok Choy Doenjang Muchim and it is sooo goood and so easy, I am glad I say the video, since I was so surprised at how much water you have to squeeze from the Bok Choy… but I did and it came our perfect… I just love it! I can see that the ingredients lend themselves to several variations of which I will try in the future, for example: I think black bean garlic paste in addition to the bean paste would be a good variation and/or adding a raw seafood, like Tiger Shrimp or Ahi Tuna as another. Is this a traditional Korean Dish or an LA Creation and have you ever eaten or prepared it? And if yes or no it does not matter, can you research it and make a video for this dish? In any event… I have been watching your videos for a couple months now and your presentation in your videos have completely refined my Asian food prep and cooking technique, which were pretty good, but twice the overall time for cooking the food (technique)… maybe you should do a video specifically to cooking technique. Posted June 1st, 2017 at 7:40 am | Log in to reply. Posted May 18th, 2017 at 1:12 am | Log in to reply. I made this today and it was awesome! I didn’t change a thing. My wife can be iffy on some of the Korean recipes I make, but not this one. All gone. Posted May 8th, 2017 at 4:29 pm | Log in to reply. 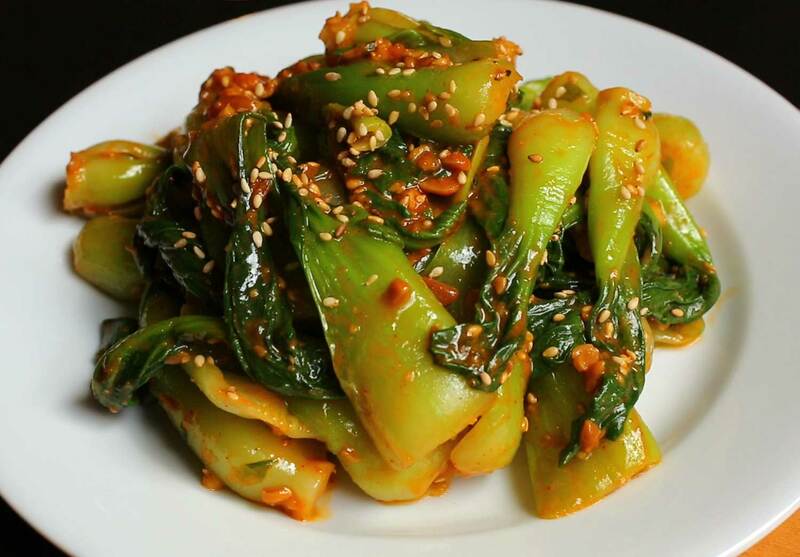 Do you have the kimchi version of the bok choy recipe? Tried it recently and it was soooooo delicious. I really want to try to re-create. Going to do this one as well. Thank you!!! Posted March 11th, 2017 at 11:48 am | Log in to reply. I know this sounds absolutely crazy… but…. Talk about delicious! It reminded me of asparagus when prepared this way. I’m thinking of other things to make doenjang muchim with… Thanks Mom! And Maangchi! LOL! Posted January 18th, 2017 at 6:39 pm | Log in to reply. Thank you so much for another great recipe! I have married into a Korean family and I was so intimidated to try to cook Korean food because it always seemed so complicated. However, your videos and instructions have made me adventurous! My husband is so happy to see food from his childhood and my in laws can’t wait to visit to see what I have whipped up! I made this tonight and it was simply delicious. I had to stop myself from “tasting” the whole bowl before dinner! Yum! Posted January 19th, 2017 at 11:47 am | Log in to reply. “My husband is so happy to see food from his childhood and my in laws can’t wait to visit to see what I have whipped up!” I’m sure your in laws will be very proud of you when they taste your dishes! Posted September 24th, 2016 at 6:04 pm | Log in to reply. I’ve been wanting to try this bok choy since forever. The way you make it looks so delicious. In my area, we don’t have many Korean grocery stores here. There’s maybe one or two, but there isn’t a Korean supermarket near here. Did you get the bok choy from a Korean grocery store, or did you buy it from a regular grocery store? My mom and I (I’ve been bugging her about the bok choy for weeks) went to our regular supermarket, and they had the bok choy, but it was white and green, instead of all green – like yours. Please help me! D: I really want to make your side dishes; they look so yummy! Like the 김치순두부찌개, 시금치나물, and the 청경채 된장무침. Having them altogether would be absolutely fantastic! Please give me any suggestions! Do I need to go to a Korean supermarket, or do regular grocery stores sell it? I’m dying to know! 고맙습니다! Posted September 24th, 2016 at 6:08 pm | Log in to reply. Posted February 20th, 2016 at 1:51 pm | Log in to reply. These are sweet purple potatoes cooked steamed, baked eel and your salad perfect fit for this dish. Made this today , I love your recipes as they are all very tasty. 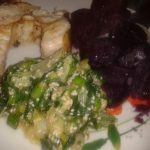 Thanks so much for sharing your recipes!Can you share the recipes for purple sweet potatoes, I love to eat them. Posted February 20th, 2016 at 3:24 pm | Log in to reply. This recipe was originally posted on November 24, 2014 at 5:06 pm by Maangchi. It was last updated on December 16, 2014. The video was watched 1,085,105 times on YouTube & has 13,844 likes!